Edvard Munch, Norwegian painter, lithographer, etcher, and wood engraver, is considered to be one of the most significant influences on the development of German and Central European expressionism. 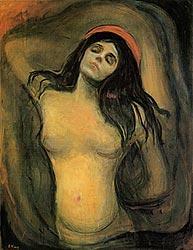 Munch's disquieting and tortuous art reflected the conflicts of his time, and his own unhappy life. Regina Harris Perfume Oil, also known as Frankincense Myrrh Rose Maroc Perfume Oil, is for me an olfactory equivalent of that painting. It is alluring, disturbing and mysterious. This is an Expressionist scent, with the notes of frankincense, myrrh and rose distorted and exaggerated to achieve an unsettling, dark and simmering fragrance. The notes are rich and complex and very smoothly blended. Lasting power is exceptional, the bottle is stunning, and, even though the price is rather high at $125 for 15ml, this scent keeps calling to me and one day I am hoping to have it in my collection. Oh, I love The Madonna by Munch. In general, his paintings are stunning, even if disturbing. Emotions must be disturbed to be moved. I have not tried Regina Harris oils, even though I used to have a whole stash of samples. I do not know why I gave them away without trying. Perhaps, it is because I do not like oil base. I think that the top notes are pulled down in oil, however given the composition of these fragrances, it must not matter very much. The bottle is beautiful. Morning, Vikochka, I am absolutely not a fan of oils either, I just simply don't know how to deal with them. But this one was really nice, I would definitely recommend trying it. It is deep and dark and gorgeous. I didn't know you had a blog! Yay! I love Regina Harris, such a beautiful fragrance. I like oils more in the summer because i have to wear rather heavy sunblocks when I go out and they stand up to the heat better. Your blog has really taken off! Congrats! Fab review! I found your wonderful blog through NST. I admire Munch's art. Have yet to try Regina Harris. Thanks for the great style of review.